Last night, the president of the WNBA, Lisa Borders announced that A’ja Wilson had been picked No. 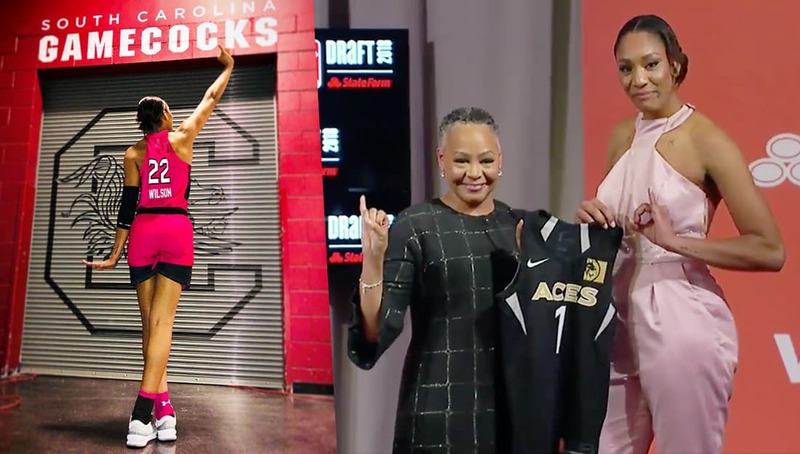 1 by Las Vegas in the WNBA draft — both women are members of Alpha Kappa Alpha Sorority, Inc. and let the world know as soon as Wilson made it to the stage. Wilson, who was wearing pink, proudly walked to the stage as the first draft pick(PHirst), hugged her soror, and threw up the signature hand sign of the first black sorority(PHirst) while holding a #1 jersey (PHirst) for a team called the Aces(the PHirst card in a deck of cards). With all of those firsts in a matter of 45 seconds, could it get more Alpha Kappa Alpha than this moment? Wilson has many accolades, she is the most decorated athlete in University of South Carolina’s history, the National Player of the Year, and became the third Gamecocks athlete to ever be selected No. 1 draft pick in any sport. Wilson is a Fall 2017 initiate of the Theta Gamma Chapter of Alpha Kappa Alpha at the University of South Carolina. Her chapter immediately took to social media along with hundreds of AKAs from across the country to congratulate her on her achievement. “Need we say more? PHirst and PHinest!” her chapter captioned the photo they posted of her. Her personal longtime favorite player, Blake Griffin, even reached out to congratulate her on her success in a video that has since gone viral. Share on Facebook if you think this should go VIRAL!